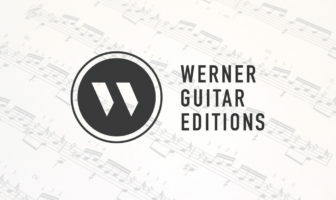 Video Lessons and Technique Reference Photos on how to sit with and position a classical guitar. This is for my students to help supplement their lessons. Remember that this is a reference for guitar and not necessarily how you will sit. Everyone’s body is different so you’ll have to experiment to see what works for you (within the guidelines). However, as a basic reference these photos should guide you in the right direction. Thanks to my student Sofia for helping with the photography. Find more articles at the Lesson Archive Page. For free lessons, sheet music, and pro videos join the Email Newsletter. Like these lessons? Consider supporting the site. Here’s how I set up my guitar and teach my students. This comes via my YouTube (HD Link). Another great video by Scott Morris via Guitar Salon International via their YouTube. In this video Morris talks about posture, sitting position, guitar supports, chairs, and more. 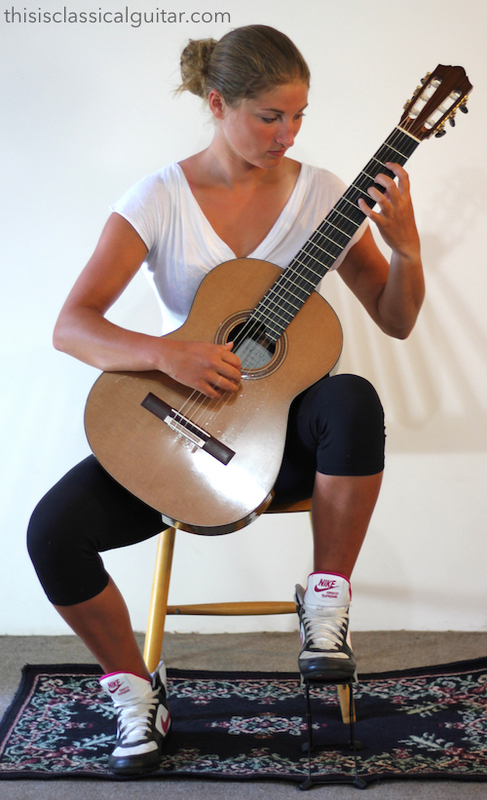 The photos below show my student Sofia using correct posture for classical guitar while using an ergonomic guitar support (click here to see reviews of supports). Tips are located below, between the photos. There is not really any different advice for the footstool, just experiment with the height until you find something that is comfortable and fits the reference photos. I’ve also included photos of myself so you can see more than one person posing with the guitar. It’s all the same tips as above except with my body type, gender, and preferences. Thanks for posting this. Excellent work. I would add that when using a footstool, ensure that the footstool is positioned far enough outside of the hip that the leg falls inward toward the center of gravity. This relieves the inner thigh, and brain, of the extra work of holding the leg in place. Strictly my observation, but I find it works quite well and very naturally. Good point Rick! Experimentation is key to the process. One must understand why and what we do with our bodies and then know the reason for doing one thing or another. What are your thoughts on using the right thigh? It’s more comfortable for some people. Are there any particular reasons/arguments in favour of using the left thigh? For many years I used a footstool and put my guitar on my left. After about 20 years I changed to my right, and use a support. It suits me and I find quite a few students, given the choice, tend to prefer the right. Flamenco players are an interesting example of alternative, but clearly very effective ways of holding the guitar. Paco de Lucia uses his right thigh and crosses the leg as well. It certainly works for him. Howard, it’s really not a question of which leg or how you position the guitar. I think the really important aspect is how healthy and ergonomic one’s position is. When I think of teaching students I’m mainly looking into their future to see if tension or even injury could result. Therefore, as in the case with good flamenco players, where exactly the guitar is located seems less important to looking closely at the body. That said, I often find that students twist their spine when the guitar is located on the right. That is not always true, as you stated. 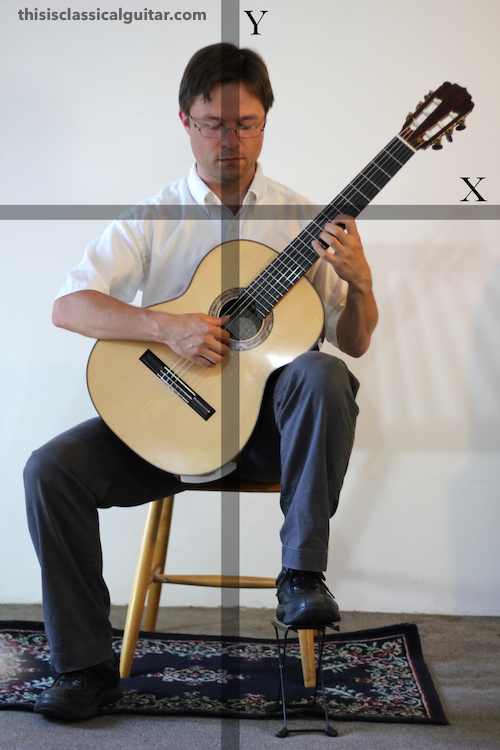 Therefore, I recommend that a very vertical guitar angle be used to incorporate the left leg. Overall I simple have more success this way. I’m also going after a specific style right. I use certain players as models for students. The players I use may not be the same as others use. One other possible problem is that the modern guitar evolved from much smaller instruments. When we increased the size of the instrument I don’t think it kept it’s ergonomic principles. We increased the size but kept the same general shape therefore making it uncomfortable for some people. In particular I find that the right arm has to extend outward. Also, with modern instruments some women find that the guitar is too close to their chest which is in part due to the modern size of the instrument. I think ergonomic supports are a reaction to this, as are the increased used of smaller scale instruments. What’s wrong with a strap? 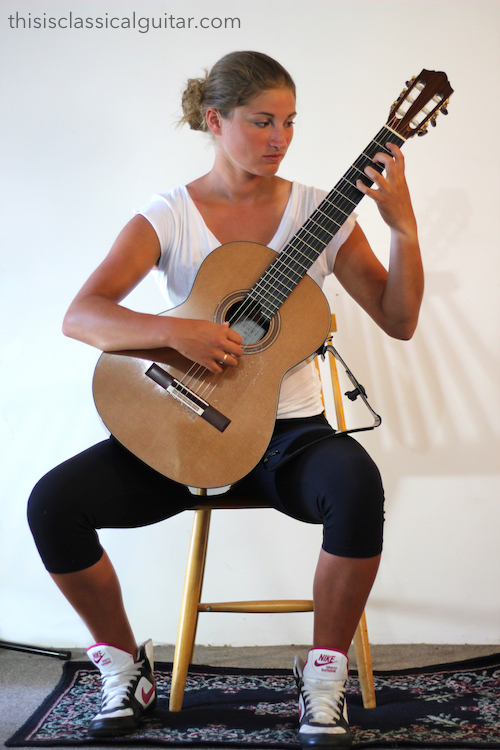 Seems to be just a fashion thing – everybody else except classical guitarists use them? I think the strap supports and makes it easier for the guitarist to hold the guitar, especially for a long time standing or sitting. Hello, thanks for the tutorial. I wonder if you wouldn’t agree that in shots of the female player, the angle of the neck is too steep? I mean, not Galbraith steep, but with such a steep angel, the right wrist no longer curves into position under the effect of gravity, resulting in less direct relationship between RH digits and the strings. I would suggest that the support is maladjusted, lifting upper bout too high–thoughts? I would like to hear a physiotherapist talk about sitting on the front edge of a chair as in the photos. I think that is a big mistake. If you played a violin in an orchestra you could move around a bit to relieve pressure on the ischial bones but the guitar position demands that you sit still all the time . 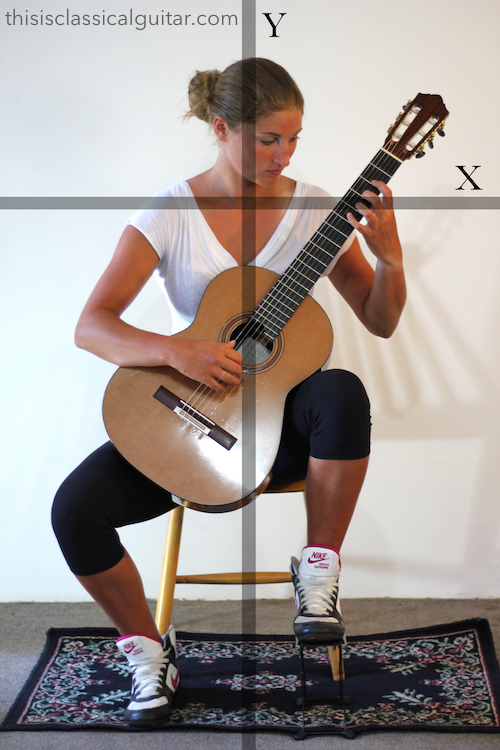 Do you advise the front edge because the guitar will touch the chair between the legs ? Yes, it has to do with the size of the instrument and how low the lower bout goes between the legs. Using a smaller instrument with a guitar support device could allow sitting fully on the chair but otherwise not sure what can be done. I am wondering about the angle of the guitar to the body as seen from above. Should it be flat against the body or leaning in or out? I find when I have the bout right up against my body my right hand feels very relaxed but this tends to push the neck more forward and then the left hand has difficulty stretching across the frets. I was looking at thos because my right forearm has been hurting while I play. I thought I’d found the solution but it just eems to moving the tension /pain between alternate arms. I have a video coming out for this post and will hopefully answer your question. Should be up by Sunday. Ideal would be a chair fitted with adjustable soft pads where you could place the guitar in it`s playing position and stand back and admire it . So can the long term experts define where the pads should touch the guitar ? I am a sub 5 year player which means I am still thinking it through . This message follows a search for guitar chairs to reveal bar stools, rocking chairs with an arm sawn off and chairs with grooves to hold a guitar still when not being played .They are “Not Playing a guitar stools “. The rocking chair one armed chair was to support the left arm when fretting the notes.(!!!!!!!) Naughty This is where we came in folks .By the way it cost a modest $3,700 . Cheap at twice the price . Humour here is not directed at any person . Put it like this i,f I made a machine to fly but did not make any wings could I seriously call it a flying machine ? An objection to a guitar chair that supported a guitar was made because it might be heavy or awkward to take along to a concert. That is not a real objection . We need to make a start before the objections overrule everything . Henry Ford`s saying with each new machine was “Let`s crank it up and see why it won`t work . ” Make it and try it first . That`s how evolution works . Hello, first thanks for your clear explanations. I have a question concerning classical guitar posture. According to Carlevaro the guitar should point forward see the article http://www.mangore.com/carlevaro-technique-2-9-53. What do you think? Thank you very much. I would like to ad that it would be nice to have a profile view on both sides for a good classical guitar posture. Some people play with the head of the guitar almost behind they shoulder, other like Carlevaro suggested that the guitar should rather point forward. Thanks. Beginners should start with the top (face of the guitar) straight up and down, that is, not angled. Some small tilt inward toward to the chest is okay but not too much. I notice that there is quite a difference between the position of the guitar with the female where the tip I f the shoulder is at about the third fret and wuite a lot shorter reach tobthe first position compared to Brad who seems to require more of a reach to the first position. We are both playing the normal sized 650mm scale length guitar and yet we are different heights and sizes. Small differences will occur. My biggest piece of advice is to watch the pro videos I post every week so you get “a feel” for how the instrument is generally held. Should the right forearm rest all of its weight balanced on the front edge of the guitar (assuming your shoulders are not hunched foreward)? Or should some muscle(s) be flexing, to partially relieve the weight of the forearm so that it feels “lighter” on the guitar? In general, let the arm rest fully on the guitar with gravity. Consider this the ‘rule’ but, that said, you might come in and out of some functional-tension that relieves the weight depending on what you are doing.